Hi everybody! I'm Mike McCrory and this is Wood U Make It. 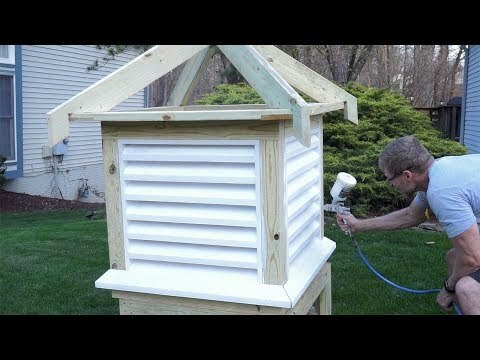 So, I'm gonna build a cupola for our friends to sit on top of the roof of their barn. The first thing I need to do is climb up the ladder and measure the pitch of the roof. that gives me 19 degrees. so, the pitch of the roof is 19 degrees. When I bought this pressure-treated lumber about four months ago it was really wet. Now it's about 6% so it's ready to be used. roof. I'm gonna build the cupola in three sections so that I'll be able to carry it up onto the roof. I'm cutting a 19 degree miter for the bottom of the leg and a 90 degree cut on the top. For the other part of the leg, I'm cutting a 19 degree bevel on the bottom. I'm going to use a whole bunch of half lap joints. So, I'm setting my dado set to the right height to cut halfway through the 2x4's. These are the crosspieces to tie the legs together and I'm cutting these to be 34 1/2" wide. Now I'm drilling holes for the screws to make it easier to screw together. Now I will attach all the cross pieces. 24 feet so I'm going to build the cupola to be 36 inches -- 24 by 1.5.
will be the section that holds the vents. And, again, I'm going to join everything with half lap joints. joint like this, this side is 3 1/2" and on this side it's 5 1/2". So, I'm going to rip 1 1/2" off each of these four pieces. Now I'm putting the pieces together to form the cube. so I couldn't pass up on that deal. So, thank you, Dana! podcasting course and a lot of videos on how to get better results with your recording. Now I'm cutting all the pieces forward the vents. There'll be one vent on each side.